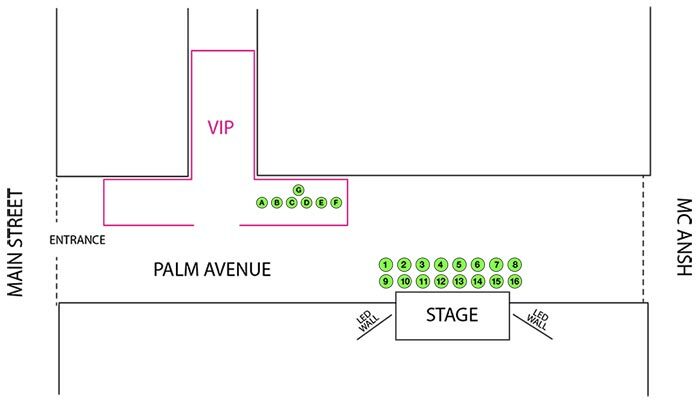 New: In addition to our standard pricing ($25 for General Admission, $120 for VIP), Chillounge Night offers reserved seating options as seen below. All seating options are reserved for the entire evening and only available to purchase till Friday, March 4, 6:00p.m. The entertainment throughout the evening will be captured live and broadcast onto two state of the art LED Walls using HD Video Streaming and making the performances come alive no matter where you are on S. Palm Avenue. LED Pro Services and VPN Studios will be providing the cutting edge technology. It entitles you to complimentary food, desserts (by Café L’Europe), coffee, alcoholic and non-alcoholic beverages throughout the evening in the secured VIP lounge area. Limited sofas, daybed and couches are available first come first serve. Purchase price includes: Private Suite with Chillounge Night furniture, 6 VIP tickets. It entitles you to complimentary food, beverages, liquor, desserts (by Café L’Europe) and coffee throughout the evening in the secured VIP lounge area. Includes private cocktail service throughout the evening so you don’t have to wait in line to get your drinks. Purchase price includes: Your private Daybed and 2 VIP tickets. Enjoy the multiple entertainment sections and fashion show in a Daybed in front of our stage. Includes food, beverages, liquor, desserts (by Café L’Europe) and coffee throughout the evening in the secured VIP lounge area. Note: Your Daybed is located in the General Admission area in front of the stage but you will have access into the VIP lounge area.